The rugged, powered Peavey PVi 8B mixer features rotary controls for level, reverb, bass, and treble on each of its 8 channels and the master section. Its amplifier delivers 150W RMS at 4 ohms and 100W at 8 ohms. 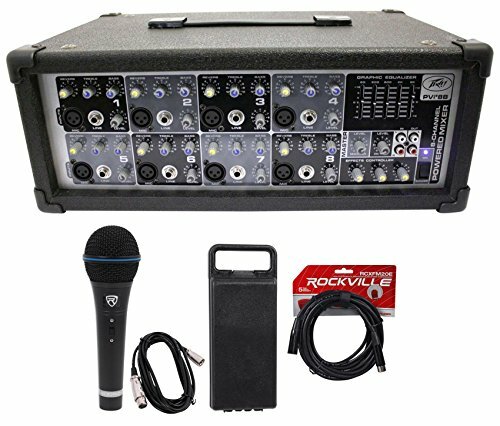 All 8 channels have a balanced XLR mic input and 1/4" line inputs. Professional 10 FT XLR Cable Included. Steel Mesh Grill. On/Off Switch. Rugged Metal Construction. Natural Sound Reproduction. Beautiful Black Finish (The perfect combination of matte and shiny black finish). Frequency Response: 50Hz-15kHz. Super Cardiod Polar Pattern. Impedance 600 Ohm ±5%. Sensitivity -60dB ± 3dB (0dB=1V/Pa at 1KHz).